Bar cookies ease of transportation make them great for bringing to a tailgate or outdoor party. The rich caramel icing and soft lemon sugar cookie will appeal to guests of all ages at your next party! The recipe is designed to be baked in a large 16.75″X12″X1″jelly roll pan, so you can cut them to any desired size before serving, or let your guests cut a piece that will fit their appetite. To make the caramel icing, you will need a candy thermometer and 2 large heavy bottomed pots. Make the cookie base first. While the cookie is cooling, make the caramel icing. You can eat them as soon as they are iced, or let the icing cool completely before covering with foil and transporting to your event. This is the recipe for the Lemon Sugar Cookie Base. Make these before the frosting. Preheat oven to 350 degrees. Put the butter into the work bowl of a stand mixer. Cream the butter until light and fluffy. Add the sugar and beat the butter sugar mixture until well combined. Add the eggs, one at a time, mixing well after each addition. Add the lemon zest and vanilla. Mix until blended. In a separate bowl add the flour, salt and baking soda. Stir or whisk until well blended. Add the flour mixture to the batter. Add the lemon juice and heavy cream. Mix on low speed until blended. Remove work bowl from mixer. Cookie batter will be sticky. Using a spatula, spoon the cookie dough onto the buttered jelly roll pan. Dip your fingers into the extra flour and gently pat the dough so that it evenly covers the jelly roll pan. Bake 25 minutes or until the edges of the cookie are lightly browned and a cake tester comes out clean from the center of the pan. Remove cookie from the oven and let it cool to room temperature in the pan. 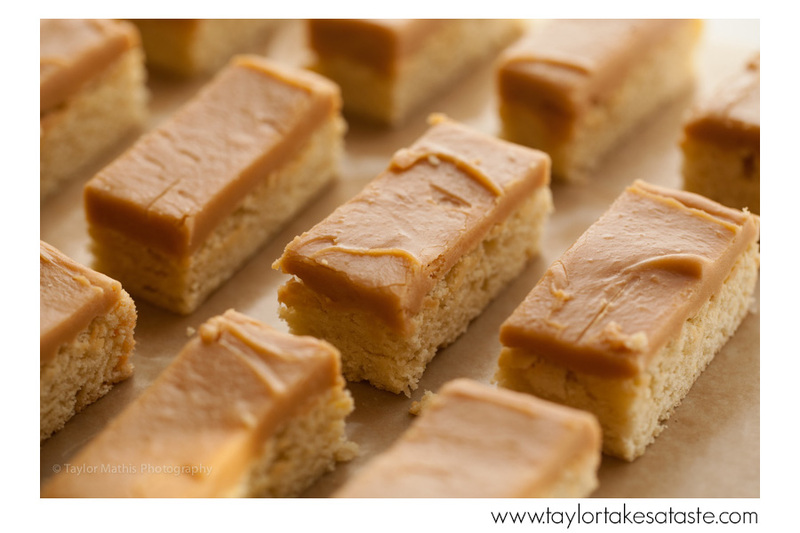 This recipe is for the Caramel Frosting to top the sugar cookie base. In a large, heavy-bottomed, high-sided pan (a dutch oven works well), melt the butter, 1 1/2 cups sugar and heavy cream over medium heat. When the butter is melted and the sugar dissolves, reduce the heat to low. Add the salt and stir. Set aside on low. Put another high-sided, large, heavy-bottomed sauce pan on a burner. Turn the heat to medium high. When the pan is warmed, add 1 cup of granulated sugar. Shake the pan frequently. When the sugar shows signs of melting at the edges of the pan, reduce the heat to medium. Continue to shake the pan across the burner constantly until the sugar is melted and has turned a rich copper color. Remove the caramelized sugar from the burner and CAREFULLY pour into the pan of melted butter, sugar and cream mixture. Stir the caramelized sugar into the cream mixture. The caramel may tighten and clump and this is OK. The caramel will melt into the cream with continued stirring and cooking. Using a candy thermometer, cook the caramel mixture until it just reaches the soft ball stage (235 degrees) over medium heat, stirring constantly. Remove the caramel from the heat and cool slightly, 3 to 5 minutes. Add the vanilla to the caramel and stir to incorporate. Add one cup of sifted confectioners sugar and stir until blended. Add another cup of the sifted sugar and stir. Add the sour cream and stir until blended. Add the final cup of sifted sugar and stir until blended. Working quickly, ice the sheet of lemon sugar cookies. Let icing cool. Slice cookies and serve. Can’t wait to try this caramel frosting. I recently took a first attempt at caramel and am hooked! I wouldn’t have thought to add sour cream to the caramel and think this treat looks wonderful. Oh my goodness, I think I just died drooling over these caramel frosted lemon sugar cookie bars. I never thought of combining these 2 delicious flavors, but now your recipe just inspired me. Thanks for sharing!